I’ve been working on a personal project lately with my mother – her words, my pictures for a giant alphabet book. 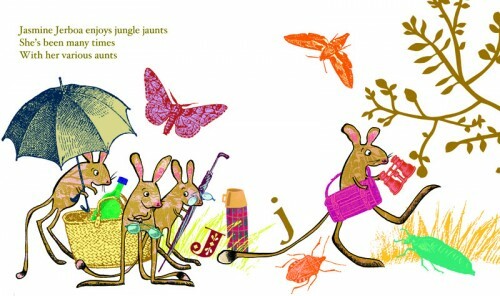 The text my mum has written is so funny and such a joy to illustrate – here’s the letter J (for Jasmine Jerboa). I had great fun with this image collaging in some giant insects from an ancient French dictionary, and couldn’t resist adding a 70s-style thermos flask – essential equipment on any jungle jaunt, surely? I’d never looked properly at jerboas before – they are very endearing creatures, like miniature kangaroos. This entry was posted in Alphabets, animals, General news, Illustration on February 27, 2013 by Jane Porter.